Birth of a Mugabe dynasty in Zimbabwe? The birth of a dynasty is not an easy thing to predict. But many Zimbabweans now seem preoccupied by the tantalising possibility that the Mugabes are seeking to join the list – admittedly a shrinking list – of families who have managed to pass the reins of power across the dinner table. President Robert Mugabe is 90. His second wife, Grace, is 49. Succession speculation has been a constant theme for years in Zimbabwe, but Grace Mugabe has only recently emerged as a possible contender. Outsiders are likely to have heard of the president’s former secretary in exclusively dubious terms – for her allegedly extravagant shopping habits; for the incident when she punched a British journalist in Hong Kong; and other alleged excesses. Zimbabwe’s state media, by contrast, have sought to highlight her devotion to charity work. The notion of a “President Grace” first gained currency in August when Mrs Mugabe – a political novice – was unexpectedly endorsed as the next leader of the governing Zanu-PF’s Women’s League – a powerful role – to be confirmed at the party’s congress in December. Fuel was added to the fire this month when the first lady became Dr Mugabe – awarded a PhD in sociology just two months after enrolling at the University of Zimbabwe, and with her thesis curiously absent from the institution’s online archives. When I rang up Zanu-PF’s spokesman Rugare Gumbo for his analysis of Mrs Mugabe’s embryonic political career, it quickly became clear that the topic was an uncomfortable one. “Please no… I’m not answering anything related to that… Come on, you can’t ask me why not,” said Mr Gumbo rather briskly. There are – appropriately enough for such a tale of palace intrigue – multiple theories. The most down-to-earth analysis holds that Mrs Mugabe has no chance of being president, and is being used by one faction within Zanu-PF. “It’s very easy to explain. She’s been brought in as a means to stop Joyce Mujuru by any means,” said the veteran political commentator Ibbo Mandaza. Vice-President Mujuru is seen as a leading contender to succeed President Mugabe. The theory goes that her long-standing rival, Emmerson Mnangagwa, is promoting Mrs Mugabe as a short-term ploy to sideline Mrs Mujuru. “When her husband goes, that’s the end of her political career if there’s such a career at all,” said Mr Mandaza, blithely dismissing the notion of a Mugabe dynasty. 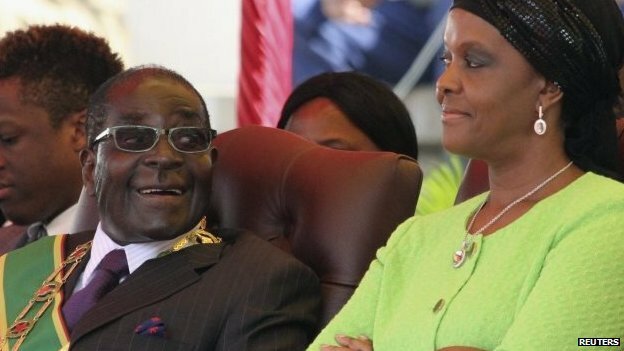 The next theory is that President Mugabe is promoting his wife primarily in order to keep all the Zanu-PF factions off-balance, and to strengthen his own position. Dewa Mavhinga, from Human Rights Watch, believes the president has made a serious mistake by bringing in someone with no political pedigree whatsoever. “It shows that President Mugabe doesn’t trust anyone around him. I think he was under pressure to control the factions and extend his own stay in office, but it was a major miscalculation and exposed him for the first time if you see how the factions are now fighting openly in the media,” said Mr Mavhinga. But there is another, less intrigue-driven analysis of Mrs Mugabe’s abrupt arrival on the political stage. Simba Makoni, a former Zanu-PF minister who ran for the presidency as an independent against Mr Mugabe in 2008, believes people are too quick to reject the possibility of a dynasty. “Grace is poised to lead the Women’s League… in December. That is a given. And my hunch is she is not going to end there, realising how easy it has been for her to get to there in such a short time,” said Mr Makoni. It is tempting to argue that a dynasty is an expression of political power – proof that President Mugabe still has the authority to impose his will on Zanu-PF and Zimbabwe. But you could argue the exact opposite – that here is a man who, after three decades in power, can trust no-one outside his immediate family.